As everyone has seen, the price of Bitcoin is in a big dip. On December 17 2017, Bitcoin reached a record high of $20.000. After this, the price crashed hard. Immediately reports appear in the media that this could be the end of Bitcoin. But is this true? 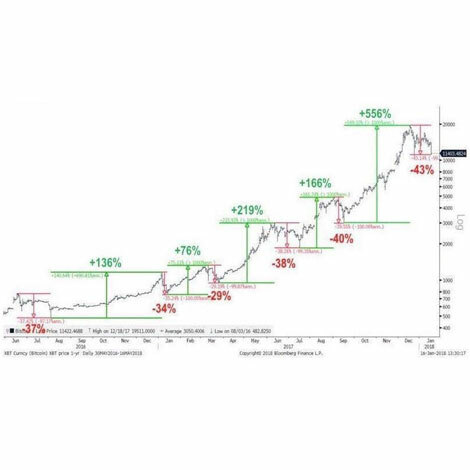 In the graph you can clearly see that strong price rises (of sometimes multiple hundreds of procents), is almost every time followed by a price correction of more than 40%. 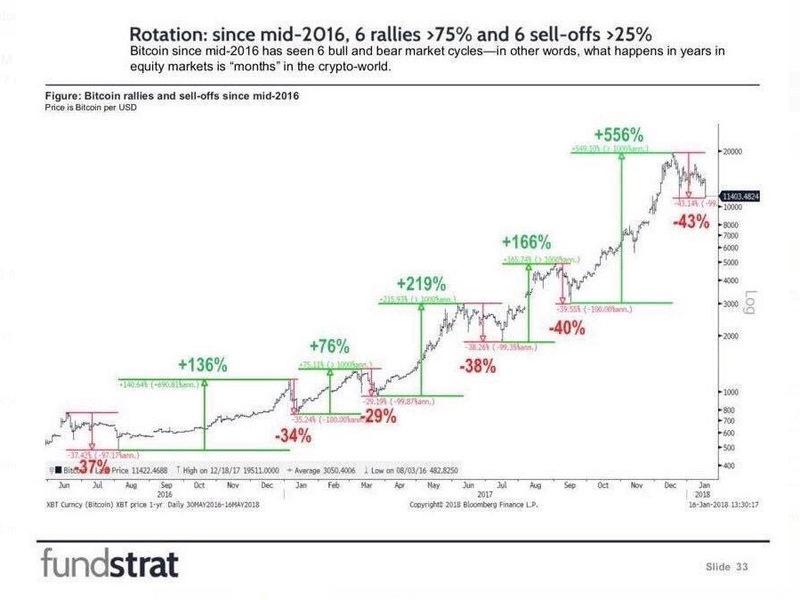 This is a repeating pattern in Bitcoin. It is also noticeable that a price correction always ends higher that the price of Bitcoin before the use rise. This results in a continuously rising price on the long term. How long can Bitcoin keep rising? Nobody has glass sphere to look into the future to see the prices of Bitcoin. However there are some fundamentals which are now at play which can result in (much) higher Bitcoin prices. – Bitcoin is seen as a new type of asset class which offers a bigger return than gold or stocks by more and more investors. – There are multiple Bitcoin ETF initiatives. It is a matter of time until they get approved by the SEC. As soon as this happend large institutional investors can now also invest in Bitcoin. – At this moment several groups are busy building the lightning network. This is a new protocol layer on top of Bitcoin that makes it possible to do very fast, very cheap and millions of Bitcoin transactions per second. This will be a very serious competitor for bank and credit card transactions.